I don't know about you, but it seems to me that there has been a bit of a baby boom in this last year. It seems like every time I turn around I see someone either pregnant or with a newborn. I blame it on the recently finished year of the rabbit. With this mini upsurge in pregnancies I've had quite a few customers ask me how they can protect the new baby in their lives. 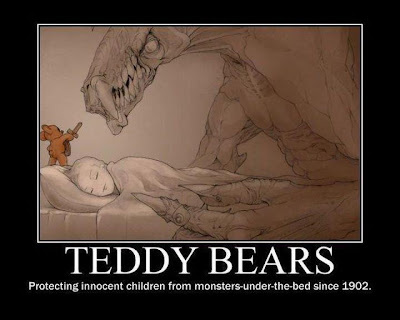 The biggest problem with this is that you need to be careful with what you give a newborn and also it's difficult to explain to a young child how or why what you are doing will protect them from those awful nightmares or that monster under the bed. The first part of this spell is to find a stuffed animal that both speaks to you and represents protection to you. Some good protection animals are bears, lions or panthers, dogs, dragons, wolves among others. Once you have your stuffy it is important to treat it like a living being. Talk to it, hug it, love it, explain its duties to it, put it in a place of honor while you get the rest of the spell together. Guardian Protector Candle or a black candle with Guardian and Protection oil on it. Place the stones and herbs in a bowl with water. Soak on a windowsill for an evening and a morning. Carve the candle with the name of the child and some affirmations and/or prayers naming the stuffed animal as the child's protector and for the child's safety and love. Light the candle and imagine the energy flowing into the stuffy. When the candle is burned down, take the stones out of the water, dry them off and sew them into the stuffed animal. Hold the stuffed animal in your arms, look at it tin the eyes and explain to it its duties: that it is to keep the child safe, happy and loved. Give the stuffy to the child. If they are over two years old, tell them the stuffy is going to protect them from bad dreams and monsters. I have been doing this for years! I'm so glad you blogged about it. I think it's a wonderful, loving gift. It's also great that we can easily obtain what we need from your store.